He de-emphasized eBay’s auction business and started describing the company as a “technology partner” to retailers small and large. eBay added clients Home Depot, Macy’s, Toys ‘‘R’’ Us and Target, helping them cope with a world dominated by Amazon. For example, eBay never bothered to develop sophisticated search technology. This made it dependent on Google ads, which took a bite out of profits. And it made it hard for users to find products they wanted to buy, dragging down sales. Likewise, eBay under Whitman never developed a product recommendation algorithm to match Amazon’s — despite the fact that Amazon credits 30% of its sales to the tool. Better search, and the ability to do merchandising and product recommendation like Amazon’s. What if I told you eBay was offered a finished technology solution to each of these problems way back in 2001 and they completely blew it off as uninteresting for their business? Trust me, I know, because my startup, which was called PriceRadar.com, was the group offering the technology. We met numerous times with Jeff Jordan at eBay, and even had offices across the parking lot from eBay headquarters right there in Campbell. We had built a sophisticated textual data mining technology, and had decided this technology could be hooked up to eBay’s data to produce a unique selling proposition. We would visit with our customers, who were major bricks and mortars retailers like Sharper Image and West Marine, to name two companies that had worked with us. Walking into a meeting we came to show them something special, something unexpected. After sending our web crawler to visit their online catalogs, we could generate a report telling them exactly which of their products they could sell on eBay for just as much as they were selling in their catalogs, how many they could sell without depressing prices, exactly how to optimize their listings including which keywords, what time of day to list and close the auction, which eBay “extras” were worth paying for, and so on and so forth. The software would even let them allocate quantities of product which we would then list on eBay for them to drop ship when the auctions closed. The bricks and mortars retailers loved it–it was easy to sign them up. For them, it was an extremely cheap way to add new customers to their house list. You know, that list that causes them to dump endless catalogs at your doorstep if you order anything from them? Our fees combined with eBay’s fees were a pittance compared to their existing marketing costs to add a new name to the house list. So that’s quote #1, making eBay a first class technology partner to bricks and mortar retaillers. That’s not all we could do. The site was called “PriceRadar.com” because it had an extremely powerful search engine that was adept at finding listings that were hopelessly lost if you tried to find them with eBay. We also tracked affinity patterns–if you bought “X” you were also likely to buy “Y” and “Z”. Plus, we generated endless analytics that the eBay people had no way to track on their own. They were always surprised and interested when we visited with this information. It included things like a fine grained breakdown category by category (and I’m talking our categories, not theirs, a taxonomy of thousands of micro-categories) accounting of exactly where their business was coming from. So much for quote #2 as well–better search and product recommendation. So what happened? Why did eBay pass on this opportunity way back in 2001? Partly, the issue was obvious: eBay had gotten fat and happy. For 10 years it had been a huge success, riding a wave of Internet adoption. During the mid-2000s, eBay was notorious for meetings that always ended in applause — even when the news was bad. But eBay also had a problem attracting and retaining innovative, entrepreneurial people into its executive ranks. The fat and happy part and the lack of innovation were terribly obvious every time we met with them or interfaced with their humongous software back end. They just didn’t quite seem to understand what we were telling them about better search and what I pitched at the time as “Merchandising like Amazon’s.” Things were so good it just didn’t seem like it was worth the effort to make things better. They’d narrowly survived making their technology scale–we used to see the news trucks parked every day at eBay so they could run a story about how the site had gone down. When you’re getting Boundless Growth and Unbridled Demand just for showing up at work, why rock the boat with any new ideas? We’re afraid that if you make it super easy for Sharper Image to suddenly have a big eBay presence the mom and pops will take that as eBay competing against them and they won’t like it, they’ll pull out. I tried hard to explain that they had no place else to go–they were hopelessly dependent on eBay. There were no other easy partners who could create an e-commerce presence for what had been small bricks and mortar independent retailers. At PriceRadar, we had interviewed dozens of the most successful resellers on eBay in various categories and learned that many of them had closed their bricks and mortar storefronts because eBay was so lucrative they’d rather sell online out of their home offices than pay the overhead of owning an actual physical shop. Many of them had unique merchandise that the big retailers didn’t have anyway. The eBayers would listen politely, smile, and then move on. We had even signed Gary Burghoff as a spokesman! 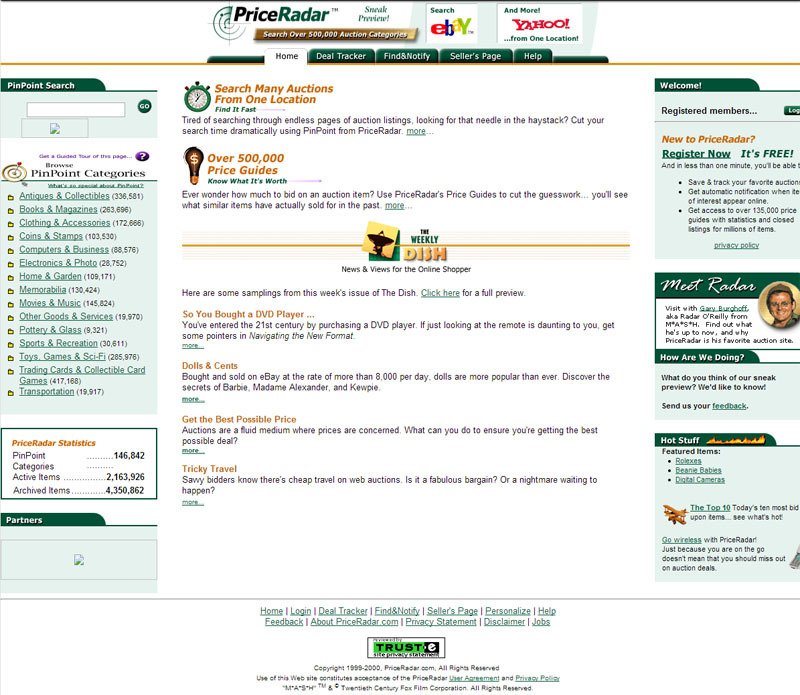 That was the Consumer Search front end circa early 2000. There was another client used by the Retailers to list their products on eBay via our service. We did a number of unique things at PriceRadar, many were things people said couldn’t be done. Like downloading all of eBay’s auction data and processing it on SQL Server–the Unix guys all said we’d have to have Unix and Oracle to make it scale, but we didn’t. We made it through the scaling hurdles that had plagued eBay in a relatively short time, handling their data volumes in our architecture. Today, it would’ve been called a “Big Data” application, but back then nobody had heard that term. The search algorithms were very sophisticated and involved a mix of computer algorithms and live human “taxonomy experts” that fine tuned the results by creating special search rules on the micro-categories. In the end, it was a bust. When we started, there were lots of auction houses out there, and it seemed like a super sophisticated search engine monetized by retailers who wanted to list was a great plan. Unfortunately for us, network effects meant that eBay controlled that entire space in a relatively short time. Once they were the only game in town, they were also the only buyer in town. Too bad for all concerned eBay didn’t realize we had the solution for a lot of problems that would nearly kill the company. PriceRadar was a great lesson in market timing and exit strategies in the face of network effects and derivative businesses. It’s also the failure I regret most as the product and technology were dynamite. At some point, Silicon Valley VC’s, whom I am not always entirely complimentary of, decided it was easier to teach a Founder to be a decent CEO than it was to teach a Big Co Exec to fill in what they’d lose if a Founder left. That doesn’t mean they don’t replace CEO/Founders, but it used to be an almost guaranteed matter-of-course. The VC’s have it right. We saw that unfold at Microsoft almost to the day Bill Gates handed the reigns to Steve Ballmer. 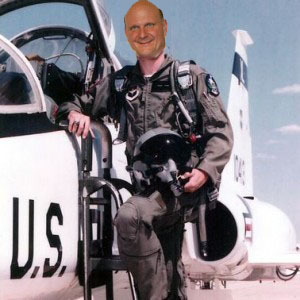 I believed then and believe now that Microsoft needed a Fighter Pilot and instead got a Moist N’ Easy Snack Cake Salesman. Sorry Steve, you’re a good man, but you were not the right man for Microsoft. Now the Microsoft Board is apparently on a path to making Satya Nadella, the President of their Cloud Business, Microsoft’s new CEO. I read with interest in a WSJ article that he is asking Bill Gates to give him advice on Technology and Strategy. That was my first red flag for this candidate. Advice on Technology and Strategy? Isn’t that exactly what’s been so badly lacking at Microsoft since Ballmer took the reigns? Did he and Bill Gates just not talk? Or is it possible that the company actually needs to find someone that knows enough about Tehnology and Strategy to chart their own course and actually dare to get Microsoft to do something different from what hasn’t been working all these years? Despite his enormous success in the tech industry, Mr Nadella is not the biggest user of Twitter. He has not tweeted since July 2010, and the messages he has posted are enthusiastic, but not particularly enlightening. That seems to be basically this guys M.O.–he’s quiet, heads down, and steady. Is this really what Microsoft needs? Quiet, heads down, and steady? I mean love her or hate her, at least Marissa Mayer has shaken up Yahoo to an extent. At least Meg Whitman had done something everyone had heard about before she took over HP. “But wait,” you say. Hasn’t Nadella run one of Microsoft’s most important and successful divisions, the Cloud division? Isn’t that a foward looking part of the empire? Not really. It didn’t take any great imagination or strategic prowess to deliver Microsoft to its present Cloud market position. Microsoft was very late to the Cloud, played it very safe, and has yet to accomplish much there. Herein lies the problem: Boards want to hire the safe choice. They don’t want to hire someone who will shake anything up until it is far too late. They want consensus. They want everyone to play nice. They want to have nice informative Board meetings where they can get their two cents in and everyone in the room will nod sagely and take the advice. There’s really only a couple of guys I’ve come up with who can make a difference for Microsoft. Either Bill Gates can come back as CEO, or Jeff Bezos could add Microsoft to Amazon and go from there. Neither one is apt to happen, so be ready to watch Microsoft flounder further.